What’s with me and the late Saturday night posts lately? Last time I stayed up past my bedtime and decided to do a post, I was filling my bowl with another frozen treat — my chocolate-banana-peanut butter mock ice cream. Tonight I was feeling fruity. And I thought you might be too, so I logged on to share this little ditty with you right quick. Stick the whole can in your freezer and let it get nice and solid. When you’re ready for your treat, take it out of the freezer and let it sit on the counter for a while, or run it under warm water to loosen things up a little. 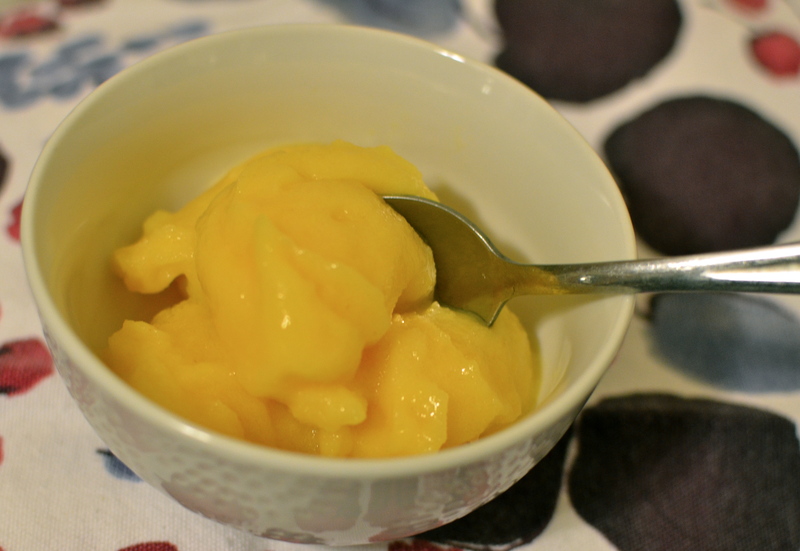 Open the can and use a knife to slice through the semi-frozen peaches and dump into blender. Blend on puree/high setting until smooth. Posted on January 28, 2012 by Sarah @ Celiac in the City •	This entry was posted in Recipes: let's eat!, What's up in the city? and tagged chocolate banana peanut butter mock ice cream recipe, easy gluten free dessert, gluten free peach sorbet, late night gluten free snack. Bookmark the permalink. I wish I could eat this. My mother had a cousin that owned a peach cannery in GA and he gave us a tour. I have never been able to eat canned peaches since then (I think I was about ten). Don’t worry all the good peach went in the cans. I just can’t get over the ones that were over ripe. Ugh! May try a version when fresh peaches come in season. Love how creative you are. And you always find the easiest recipes for people to try out. You’re fabulous. LOVE it! I do that with bananas a lot!! I used to make it all the time, years ago (pre-GF) but then kind of forgot about it — so glad it has reappeared around here!